Summer is fast approaching and more and more fruits and vegetables are coming in season. One of my favorite spring/summer crossover vegetables is rhubarb. I love its tart flavor and bright pink color. It complements a variety of sweet and savory dishes. It's most commonly known as pie fruit and is more often paired with strawberries than with any other fruit or vegetable. But I like it when it plays the leading role in a dish and not the supporting one. On those especially hot summer days all I crave are cooling desserts that are simple to make ahead of time. One of my favorite chilled desserts is the Italian panna cotta, which is basically jellied cream. 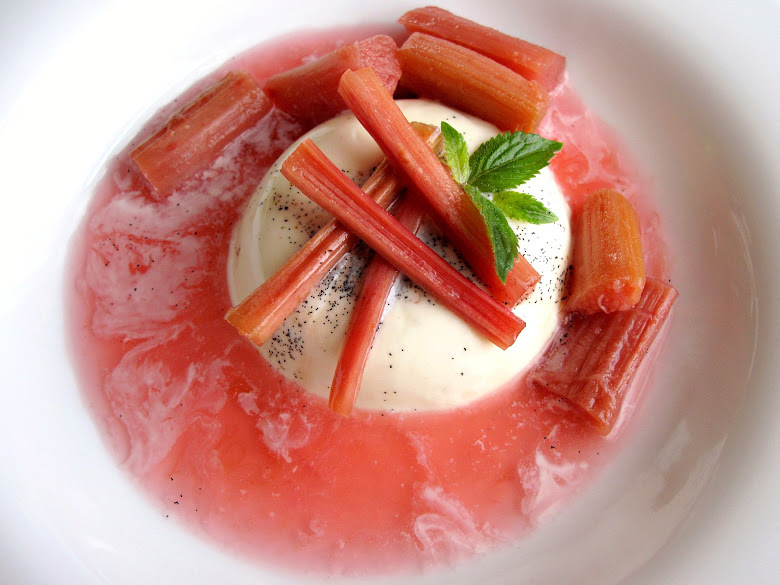 In this dessert the panna cotta serves as a perfect base for rhubarb, prepared in two different ways. One batch is roasted with sugar and then infused with cinnamon and sparkling wine. Another batch is pickled in a honey-sweet brine with a bit of grenadine for color and star anise for a touch of spice. The sweet, tart, savory, and crisp intermingle as the two rhubarbs meet on the plate. Many recipes for rhubarb call for peeling the vegetable before cooking. I leave the rhubarb as is and only trim about an inch from either end. If I see brown spots, I use a vegetable peeler to remove them. The color is in the outermost skin, so why have it go to waste? Chill six 6-ounce custard cups. In a small saucepan, bring heavy cream and sugar to a simmer. Split vanilla beans lengthwise and scrape, removing seeds; add to cream. Discard beans or use for another purpose. Meanwhile, sprinkle gelatin over 2 tablespoons milk in a medium bowl. Once sugar is dissolved and bubbles begin to form on the surface of the heavy cream, add it to the bowl of gelatin, whisking vigorously until gelatin has dissolved. Add remaining 1/3 cup cold milk and whisk until slightly cooled. Evenly divide the mixture among the chilled custard cups. Chill for at least 2 hours or overnight. When ready to serve, run a thin knife along the cream and dip and hold custard cup in simmering water for 15 seconds. Turn out into a small bowl. Yield: 6 servings. Based on Jamie Oliver's recipe from his book Happy Days. In a baking casserole, combine rhubarb and sugar. Bake, stirring occasionally, until rhubarb is lightly browned and tender but still holds its shape, about 20 minutes. Alternatively, in a skillet on medium-high heat, cook rhubarb with sugar until it is light brown and tender but still holds its shape, about 10 minutes. In a small saucepan, warm sparkling wine with cinnamon stick. Pour over rhubarb. Once cooled, chill in the refrigerator. Yield: 4 cups. Based on Johnny Iuzzini's recipe from his first book Dessert Fourplay. Note: I prefer homemade grenadine to the store-bought kind, which is laden with artificial flavor and coloring. To make your own, bring 2 cups of pomegranate juice to a boil and then lower to a simmer. Once reduced by half, add 1 cup granulated sugar and heat until dissolved. Once cooled, store in a jar in the refrigerator. Yield: 1 cup. Place rhubarb in a large heatproof container or 1-quart jar. In a small saucepan, combine remaining ingredients and bring to a boil. Let cool slightly. Pour over rhubarb and cover with plastic wrap or jar lid. Once cooled, chill in the refrigerator. Yield: 4 cups.